On Saturday 7th May the Marks in Time exhibition was transformed! Our very own archive catwalk appeared, complete with lighting, music and visitors waiting on the front row for the show to begin. 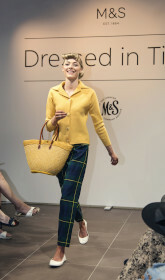 We created 21 outfits, starting with the 1930s and ending with the current Archive by Alexa range, to showcase the fascinating history of fashion at M&S. 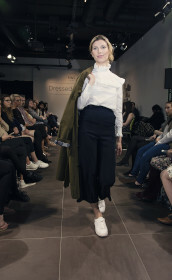 The garments and accessories modelled on the catwalk were replica or vintage items from our handling collection. This collection has been created to be used for community outreach and engagement activities and is separate from our core collection. Items from our core collection are cared for and stored to professional archive standards at the M&S Company Archive building, and could never be worn in this way. 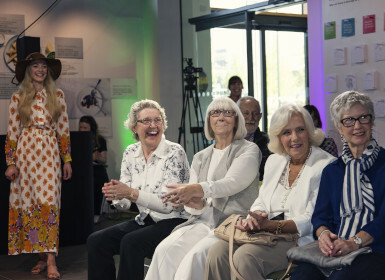 Each look had it's own theme tune, and our presenter explained how M&S innovation and design from each era both reflected and shaped changes in fashion and social history.